The National Basketball Association (NBA) has entered into a partnership with the Natural Resources Defense Council (NRDC) aimed at having the NBA “reduce its ecological impact and to help educate basketball fans worldwide about environmental protection”. NBA arenas owned by both private commercial enterprises and designers involved in government owned arenas can use a variety of tax incentives to accomplish these goals. NBA basketball arenas are big structures that have the potential to utilize large Code Sec. 179D Energy Policy Act (EPAct) tax deductions to help achieve their targeted energy efficiency goals. Code Sec. 179D provides up to $1.80-per-square-foot tax deductions each for lighting, HVAC (heating, ventilation and air-conditioning) and for the building envelope. Chart 1 presents the potential EPAct Code Sec. 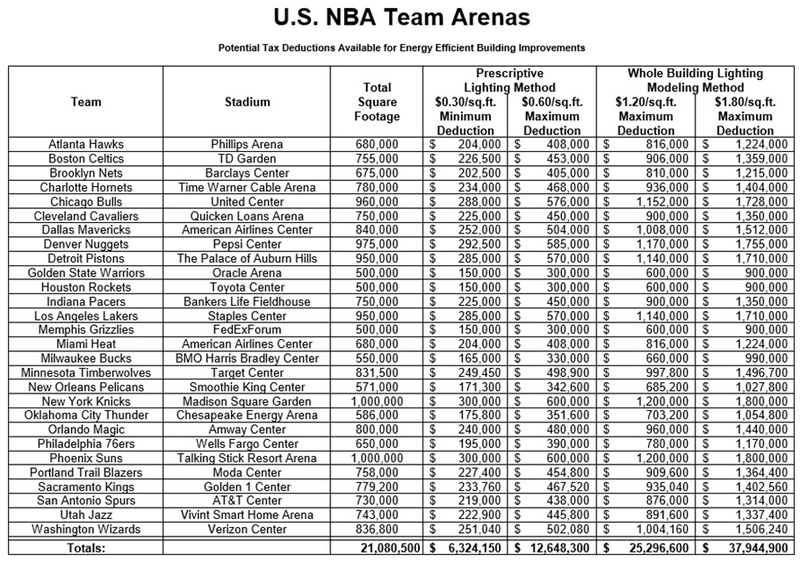 179D energy efficiency tax deduction benefits for a sample of the NBA’s current U.S. arenas. NBA arenas use a lot of electricity for interior building lighting. Today’s building lighting products, on average, use 40 to 60 percent less electricity then those lighting products of only five or six years ago. The maximum 60-cent-per-square-foot lighting tax deduction is calculated on a room-by-room basis, which means the main seating and event area can generate the largest lighting tax incentive. Specific types of stage and task lighting can be excluded from the energy efficiency tax calculation making the strictly building-related energy efficient lighting incentive easier to obtain. NBA stadiums are often supported by large parking garages that can use EPAct tax savings to upgrade to energy lighting. Many of the parking garages adjacent to NBA arenas use prior generation probe start metal halide lighting that is energy inefficient, and as of January 1, 2009, is illegal to manufacture or import into the United States. To obtain the 30-to-60-cent-per-square-foot tax deductions for parking garages, the watts per square foot have to meet prescribed targets. One of the largest energy users in NBA arenas is HVAC (heating, cooling and air conditioning). Arenas can use highly energy efficient special purpose HVAC solutions, such as energy recovery ventilation, geothermal and thermal storage, to greatly reduce energy usage and potentially qualify for a large EPAct HVAC tax deduction. Many of the NBA arenas are within city centers where electricity in particular is supply constrained. A material reduction in energy use in these facilities will greatly benefit the communities that support professional basketball. One HVAC technology that can greatly reduce arena peak time electrical energy use is thermal storage. With thermal storage systems, ice is manufactured at night when electricity is in excess supply and electricity prices are very low. This inexpensive energy is then used to cool the building down during the day when electricity is in peak demand and is very expensive. The one million square foot Wells Fargo Facility hosts nearly 300 events a year, including games for the NHL’s Philadelphia Flyers and the NBA’s Philadelphia 76ers. Michael Ahearn, Vice President of operations for the Wells Fargo Center in Philadelphia, expressed the benefits of their thermal storage system this way: “It’s a system that works for everyone… It helps reduce our expenses and saves energy for the rest of the community.” NBA arenas that invest in thermal storage will generally qualify for the $1.80-per-square-foot tax deduction presented above and those that already have thermal storage should be positioned to obtain the $1.80-per-square-foot tax deduction when making further arena facility energy reducing investments. Unlike lighting and HVAC, the building envelope does not actually consume energy so the 60-cent-per-square-foot Code Sec. 179D arena building envelope tax deductions will be predicated by achieving energy efficient lighting, and in particular, HVAC energy efficiency targets. Qualifying the building envelope items for tax deductions include roofs, walls, doors, windows, foundation and insulation. Accordingly, those arenas that have or are proposing to have highly energy-efficient measures such as thermal storage or geothermal, will be positioned to simultaneously achieve large tax deductions for investments made in qualifying building envelope items. To obtain the HVAC and building envelope tax deduction, the arena must be modeling in IRS approved modeling software. Code Sec. 179D lighting tax incentives do not require modeling. New LEED (Leadership in Energy and Environmental Design) arenas must be modeled to qualify for LEED. LEED certification is increasingly being required to be accomplished for most new government-owned or government-funded arenas. Some state and utility rebate incentives require modeling, particularly for large energy reducing projects. All arenas that have or are contemplating thermal storage, geothermal or energy recovery ventilation should strongly consider having their building modeled to evaluate the building’s performance and then secure their probable Section 179D tax deductions. Many state and utility rebate programs will pay all or a portion of modeling costs pursuant to proposals to make new energy efficiency investments. The American Airlines Arena is the first NBA arena to achieve the coveted LEED certification status. According to the April 29th, 2009 press release, the arena’s energy efficient features include a roof that reflects heat and an offsite chiller for air conditioning. Over the past five years, the facility has maintained its steadfast commitment to environmentally sound principles and practices – so much so that the facility completely bypassed its initial LEED Silver goal and achieved LEED Gold, the first arena in the world to receive LEED Gold recertification. When compared to other public assembly facilities, the Arena uses 26.5% less energy per square foot. In 2014, Miami-Dade County received $1.135 million from Consolidated Edison Solutions, Inc. resulting from the federal 179D allocation associated with recent improvements completed by ConEdison Solutions to the County’s downtown chilled water system. Our firm, Energy Tax Savers, directed the tax work related to this project. 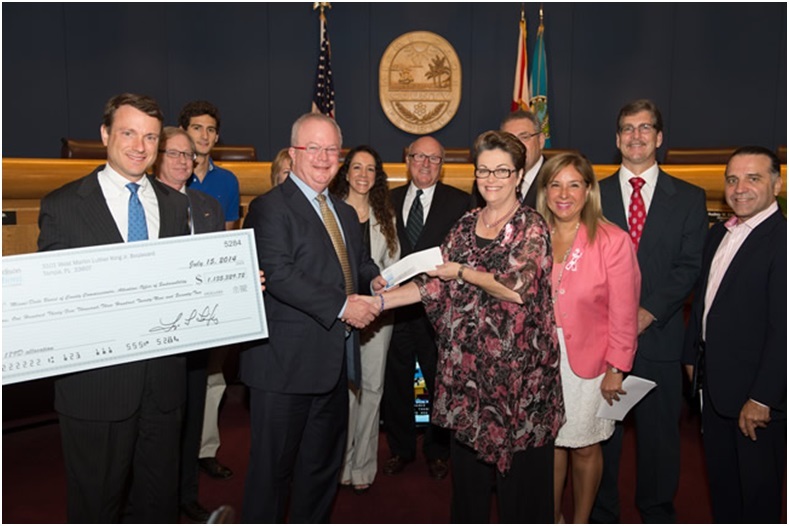 Representatives from ConEdison Solutions present Miami-Dade County with $1.135 million check. The NBA Green Initiative presents tremendous opportunity for energy and tax savings for both commercial owners and designers involved with government owned arenas. For the last 12 years the NBA has made large capital investments in automated computer and software systems to measure player performance statistics. NBA Executive Vice President of Operations and Technology, Stephen Hellmuth, said “You’re not in a league unless you got a statistics system.” Presuming NBA Commissioner Adam Silver takes the same approach in monitoring and measuring arena energy performance while identifying the related tax opportunities, the NBA can be of great service in helping lead the nation into an energy-efficient future. The NBA and the NRDC are hoping that the NBA green initiative will serve as a model and catalyst for other facility’s green initiatives. Reducing arena energy uses will serve as a direct model for the myriad of other inner city athletic facilities including K-12 school athletic facilities and community college and university athletic facilities. Indirectly, the NBA green initiatives will influence many parties since NBA activities are widely followed and emulated.